I think this smell is coming from my crawlspace! Along with unwanted critters, mold, and rotting wood, crawlspaces don't always make the most pleasant environment. 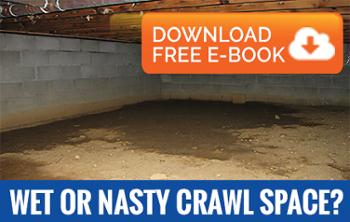 Many common crawlspace problems are due to a moisture problem. Call a professional to inspect your crawlspace at (224) 701-3992! Why is there excess moisture in my crawlspace? Too much ventilation. What? I know that this seems backwards to logic, but outside air coming in cools the crawlspace down. Cold air cannot hold as much water vapor as warm air, and therefore releases the excess humidity into the air. A study done by the Advanced Energy field study demonstrated that insulated crawlspaces achieved better results than well-ventilated crawlspaces. Standing water. This can be due to a variety of causes. Standing water can be present due to a leak or the environment your house is in. Evaporating water. Tiny cracks in the soil or walls of a crawlspace release moisture into the air, which can increase the relative humidity that is consistently in your crawlspace. Proper Drainage-whether it is the use of sump pumps, redirecting gutter downspouts, or french drains, it is important to get rid of potential causes for standing water or excess moisture in your Dundee properties. Vapor Barrier -Most homes today will need a 6 mil polyethylene liner with overlapping seams and 100% coverage to trap the moisture from evaporating into the air of your crawlspace. Our trained technicians can assess your situation to see if this is the right option for the type of home and situation you have. Waterproofing -AdvantaClean of NW Chicagoland can provide this two-step process option. Essentially, the first step will seal the walls, ceilings, or floor where water is wicking through and forming efflorescence. After we seal the walls, we apply a waterproofing agent with a stain-resistant finish to prevent seepage from coming through.